An abominable army of automatons has plunged Xanth into dire peril in Pet Peeve, the 29th hilarious adventure in Piers Anthony's beloved fantasy series. All that stands between the enchanted land and destruction is a most unlikely hero, a forlorn, mild-mannered Goblin named Goody, whose courteous ways have earned him the scorn of his ill-tempered goblin fellows. Assigned by the Good Magician Humfrey to find a appropriate abode for the Pet Peeve--a foul-mouthed fowl who insults anyone it encounters, Goody reluctantly sets out on this daunting quest, armed only with a bag of half-spent spells, and guarded by a brawny woman warrior called Hannah Barbarian. But when Goody's mission unknowingly triggers an invasion of Xanth by a horde of mechanical marauders from a faraway Robot World, he must enlist the aid of Xanth's many denizens--dragons, zombies, centaurs, demons, elves, and even goblins like himself. And, in the heart of Goblin Mountain, Goody finds an unexpected ally - Gwenny Goblin, a beautiful, strong-willed goblin chief who can help him rally Xanth to repel the robot army, and perhaps mend his broken heart as well. 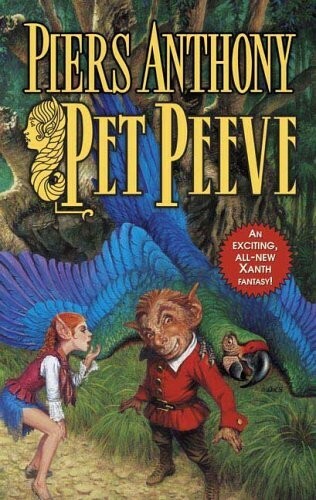 Brimming with heart-stopping adventure and heart-warming delight, overflowing with wicked wit and wanton wordplay, Pet Peeve is Piers Anthony in rare form, an exceptional new chapter in the continuing chronicles of Xanth.